The Mom Standard: Blog Awards! Thanks to Anna at The Dave Ramsey Road and Kimberly at The Stinker Pinkers for presenting me with The Versatile Blogger Awards! I'm that neighbor that doesn't talk to anyone-my hubs does enough for both of us. Based on #7, a Type A personality, and a diagnosed anxiety disorder I see a therapist regularly and think everyone should! I love reading other people's blogs...it's like looking through a person's windows at night and seeing who they really are. Ok, so another reason for #8 I guess. 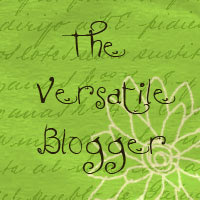 There are many more blogs I could add to the list, so maybe I will at a later date. I'm sleepy now. Good night everyone! Congrats on your awards! How exciting! I am following your blog now!